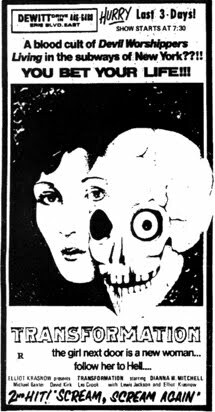 I love this stuff you keep digging up. 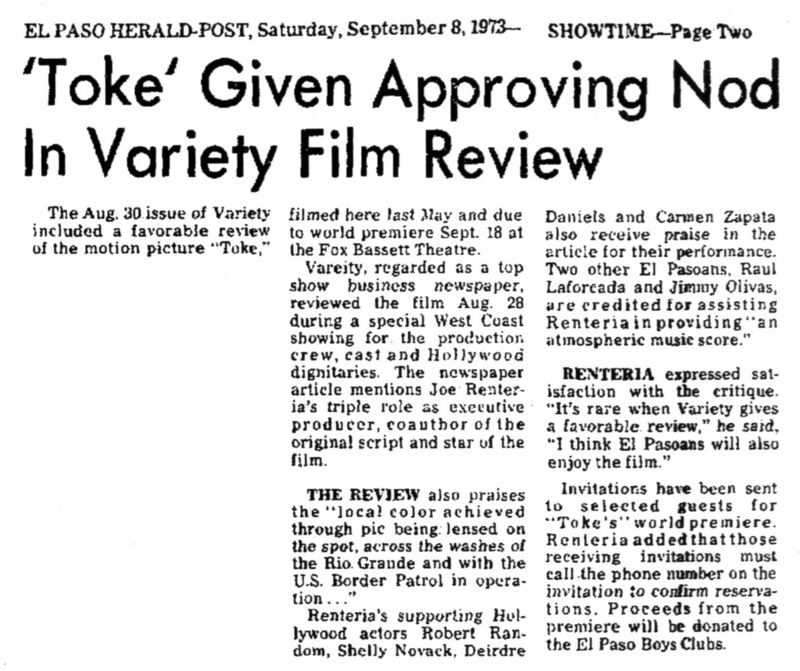 I remember hearing about Shelly Novack's death on the radio and discussing it with my Mom. 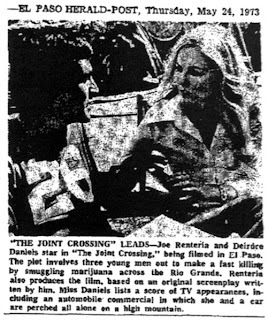 "It was probably drugs," I remember her saying. 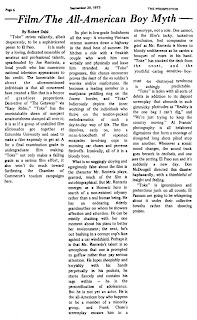 Thanks for this posting, Chris- very interesting articles and ads. 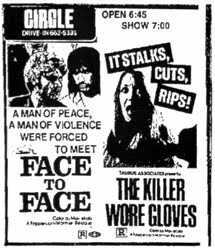 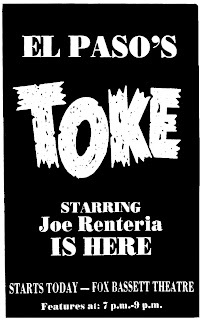 Reading through the articles, I was surprised to notice the name of Tom Neyman- "The Masss-terrrr" from "Manos" The Hands of Fate himself- mentioned as a cast member of Toke/Joint Crossing when it was in pre-production. 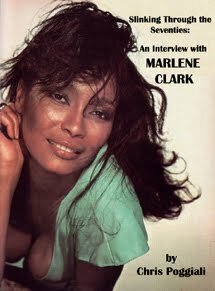 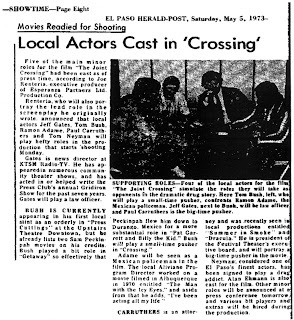 Both "Rentaria Inspires Script, Finanaces of Upcoming Movie" (April 25, 1973)and "Local Actors Cast in 'Crossing'" (May 5) said that Neyman would play an addict/drug addict. 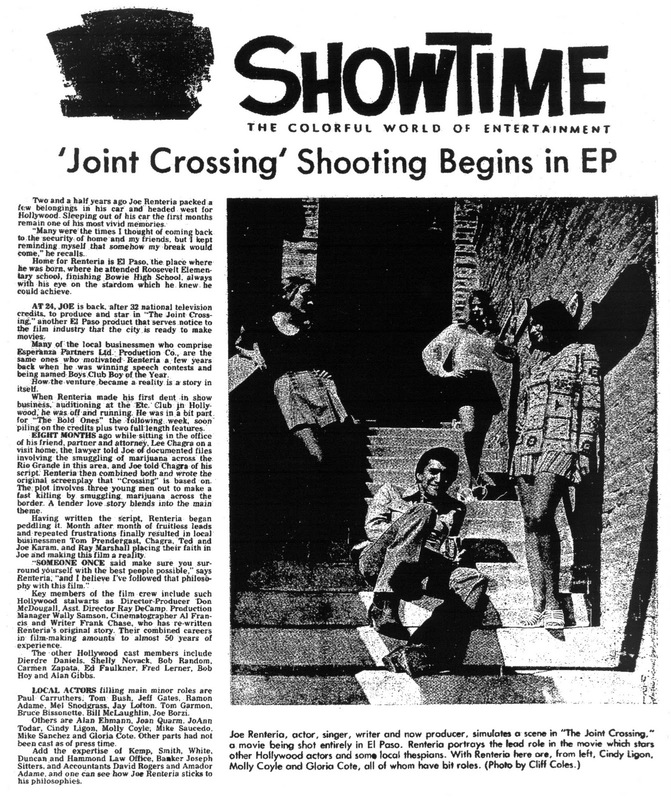 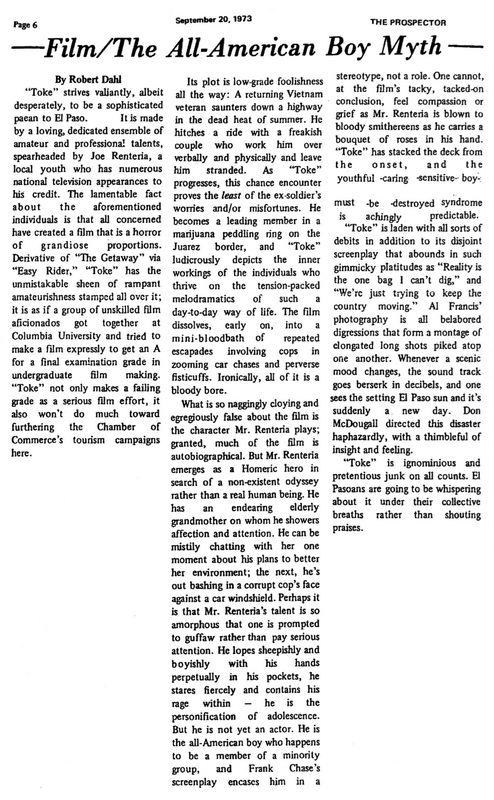 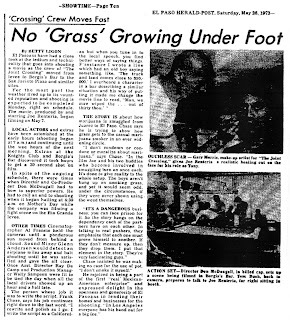 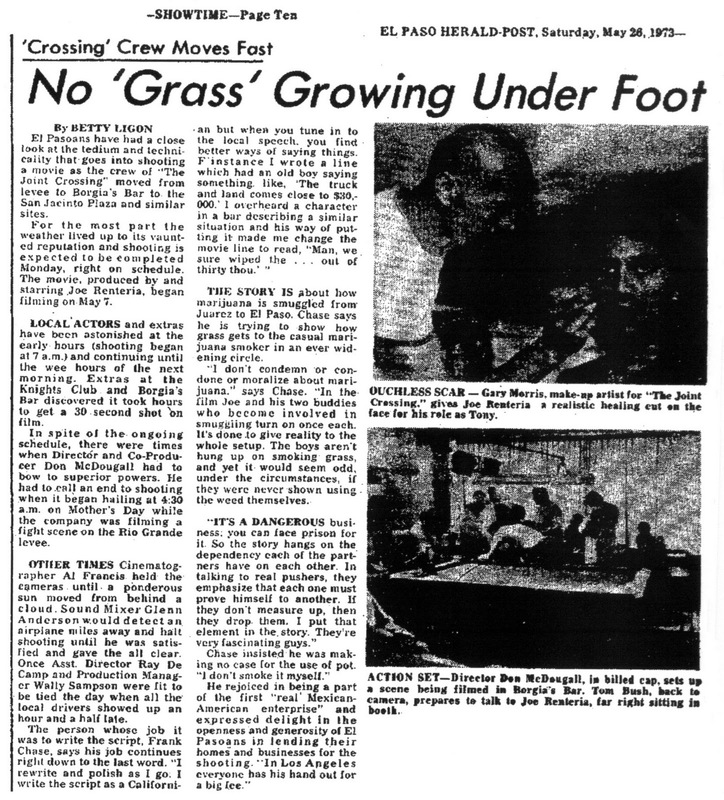 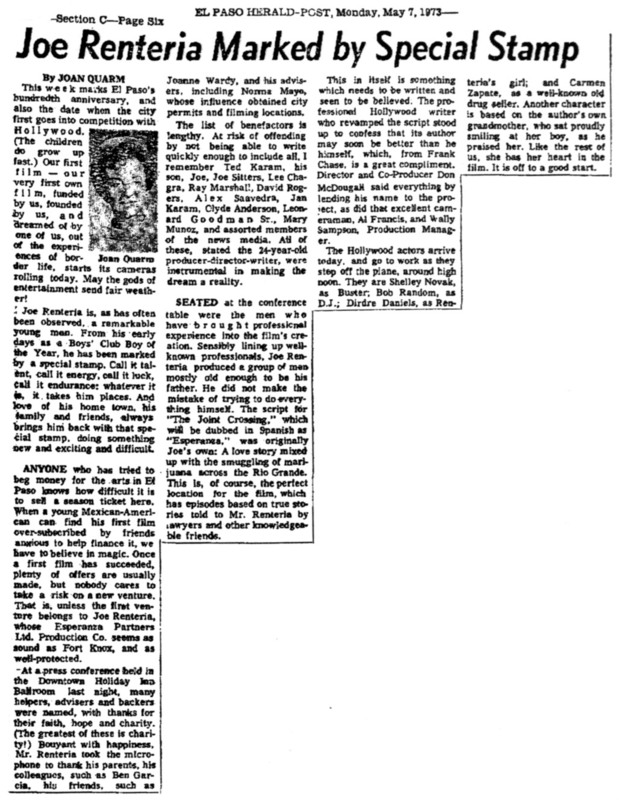 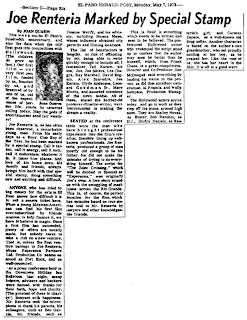 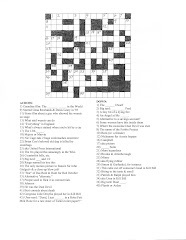 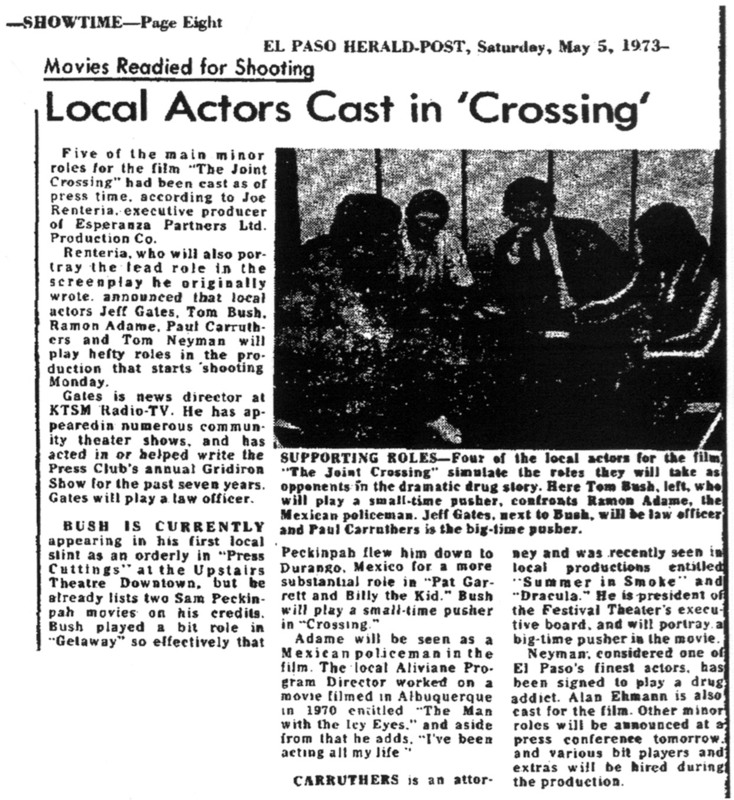 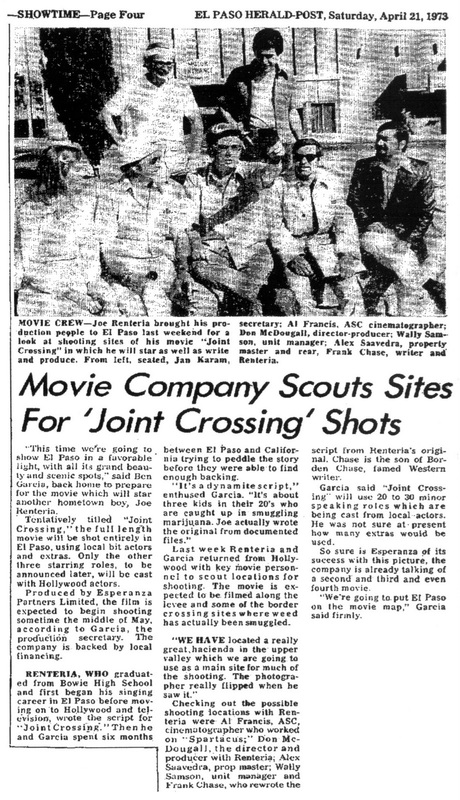 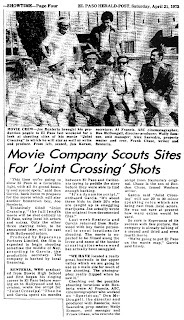 On the other hand, the (undated, as far as I could see) "'Joint Crossing' Shooting Begins in EP" has a longer cast list, but no mention of Neyman- and Joan Quarm's review ("Movie 'Toke', Part of Life Along U.S. Mexican Border") mentions a William McLaughlin in the role of an addict, and says nothing about Neyman. So it sounds like Neyman isn't in the movie- but still, it would be cool to see Toke to see whether or not he's in there somewhere. 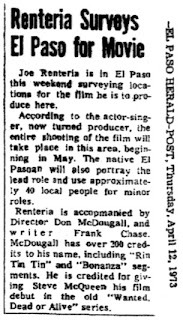 And speaking of Manos- the "Local Actors" article says that Neyman is "considered one of El Paso's finest actors", but makes no mention of role in Manos- although Alberto de Martino's The Man With [the] Icy Eyes rates a mention. 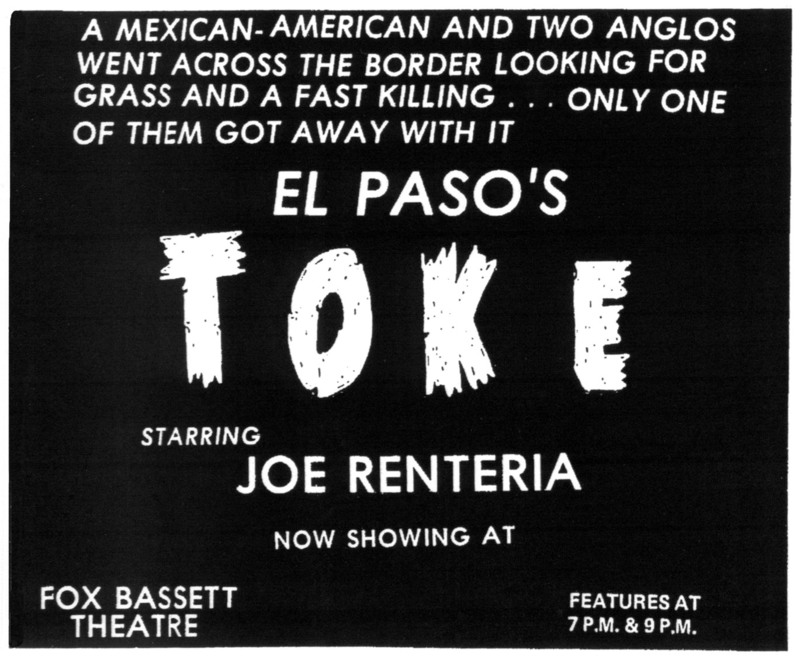 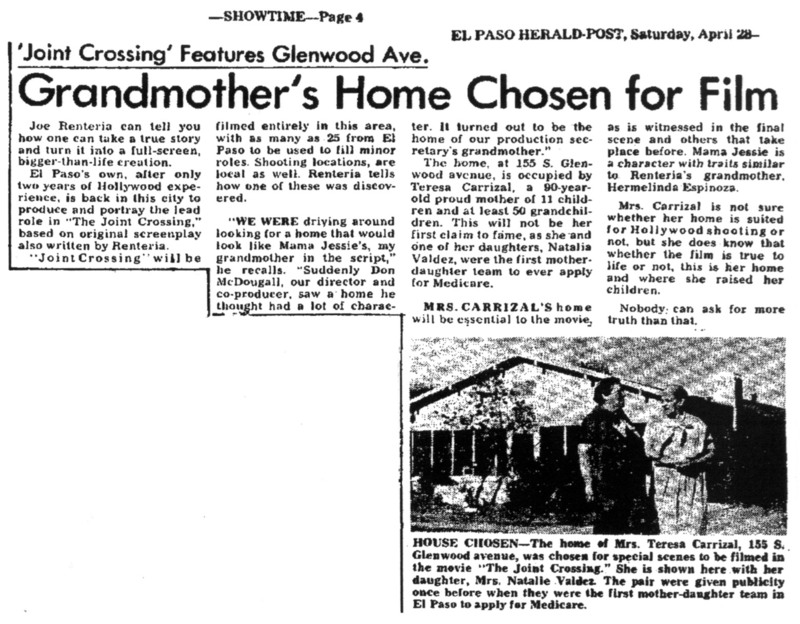 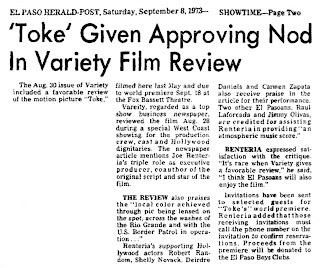 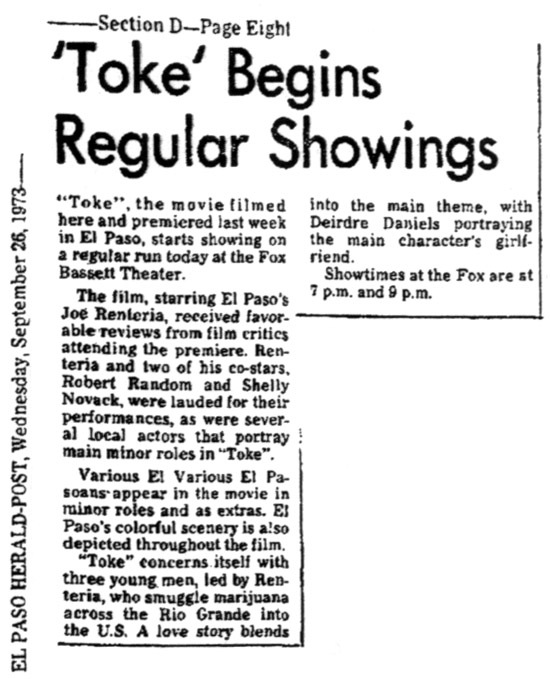 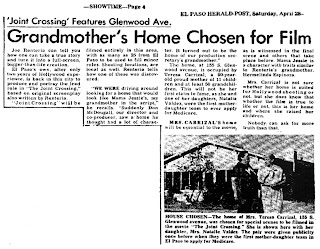 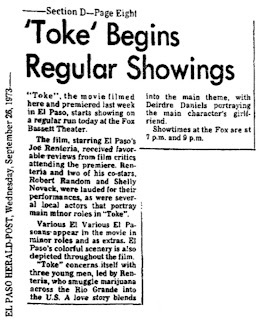 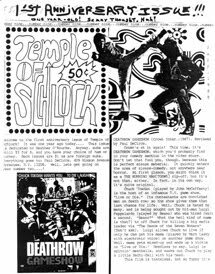 And Joan Quarm's "Joe Renteria Marked by Special Stamp" article refers to Joint Crossing/Toke as "Our first film- our very first own film, funded by us, and dreamed of by one of us"- completely ignoring Manos, which was (mostly, apparently) made in El Paso, by a resident of El Paso (or at least that's what Harold P. Warren's Wikipedia page says). 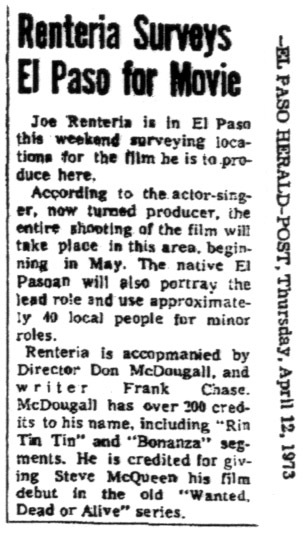 So it seems that less than seven years after the (reportedly less than successful) premiere screening of Manos in El Paso, it was forgotten by at least some of the press in that city. 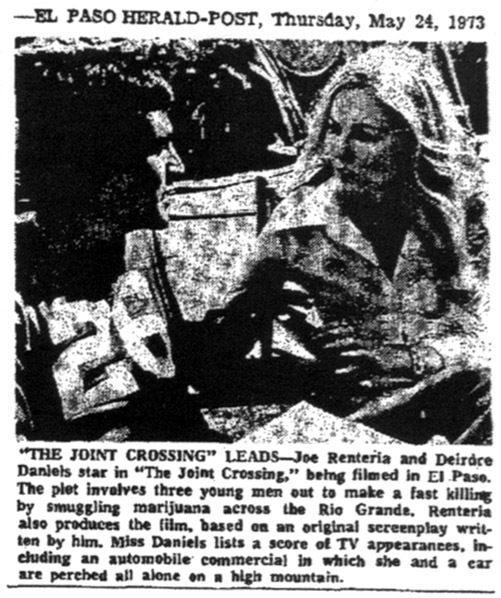 Per "The pot king of the Western World", Jamiel "Jimmy" Chagra claimed (decades after the fact) that anyone who smoked pot in the 60s/70s was smoking weed that Jamiel Chagra himself had "imported". 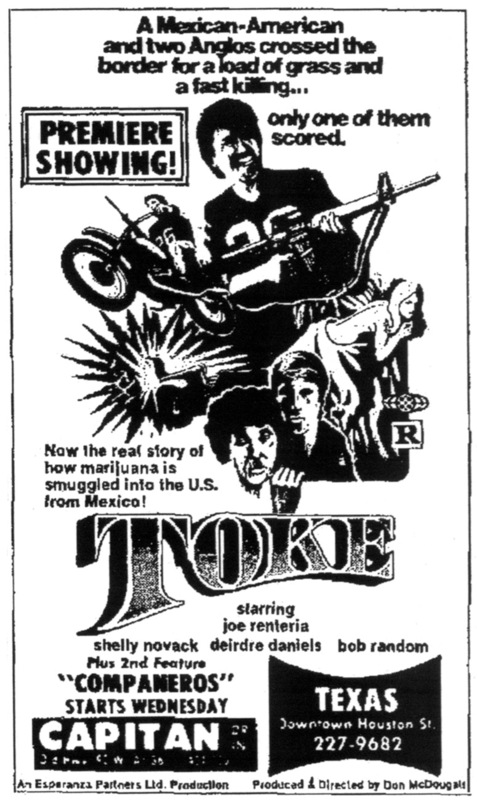 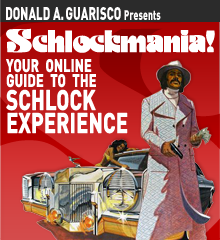 According to Knapp, "For a period of several years back in the heyday of reefer, Jimmy Chagra was the undisputed marijuana kingpin of the Western world. 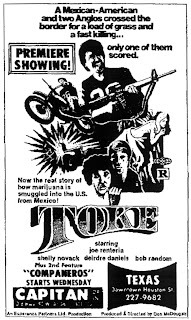 He imported more high-grade ganja than anyone, tons at a time, planeload after planeload." 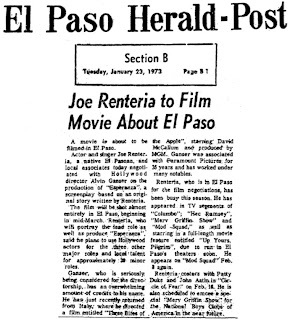 That adds a little something to the backstory behind the movie mentioned in "'Joint Crossing' Shooting Begins in EP"- how Lee Chagra told Renteria about "documented files involving the smuggling of marijuana across the Rio Grande", and how what Lee Chagra told Renteria contributed to the film's story. 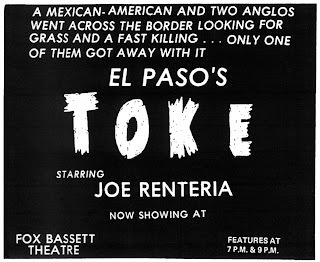 Tom Neyman, Alberto De Martino, Woody Harrelson's father- strange to find all of them with some sort of connection (however distant, peripheral, tentative, or whatever) to Toke... but there you go. 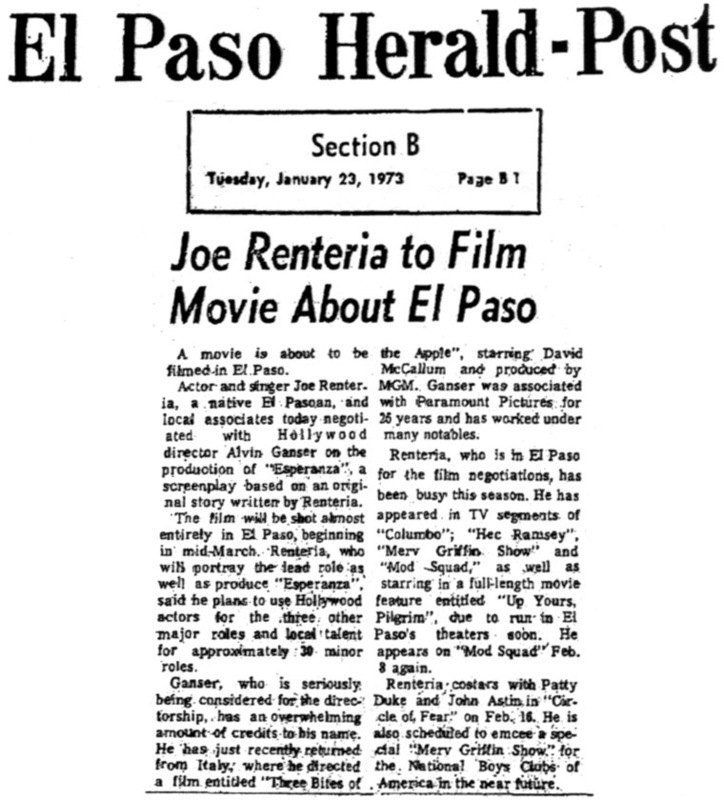 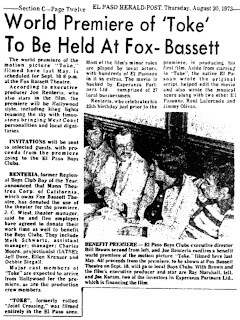 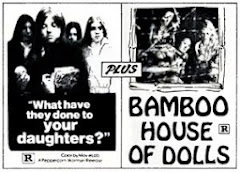 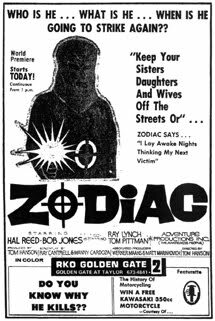 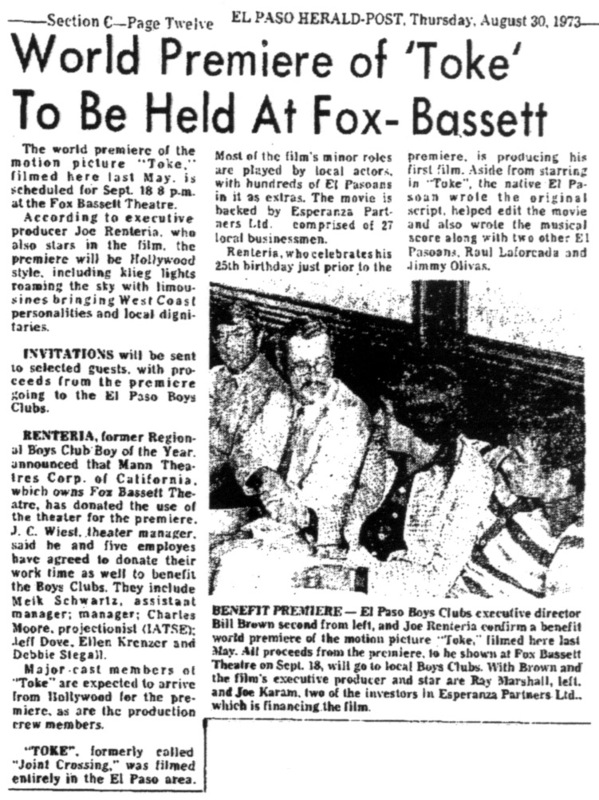 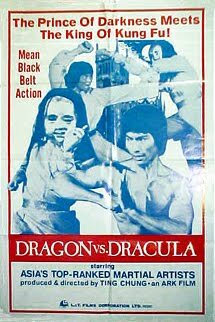 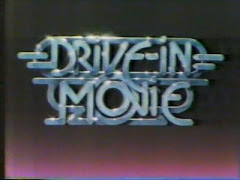 Thank you for this post.I have always been intrigued with this film and am desperately seeking a copy.As the son of a single mom in EP in the 70's I attended a screening of this film at the Fox theater (?Bassett Center)My mom dated Jimmy Chagra(I found out later he was married at the time) From his niece with whom I attended "La High" with.She(my mom) was kept by him for a short time in a high end apt on the west side near his home.During this time we were invited to the screening and it left an impression on my young mind.She told me at the time of Chagra's involvement in the film.Lee Chagra was assassinated by a gov't scapegoat under Ross Perot who was then the newly formed DRUG CZAR of Texas a program later adopted by the feds.When the EPPD went into Chagra's office they illegaly searched all of his files.Over the next several years there were multiple columbian cocaine and MJ busts and the Chagra family was effectively taken down.As a result the now murderous Juarez mafia took control of the area.The Chagra's reign over ElPaso was honorable and benign compared to what has happened since.Right now Juarez is the most dangerous city in the world.All a result of that little big eared egotist and his sinister plan to disrupt free enterprise.I could only imagine what the border would be like today if things had gone differently. 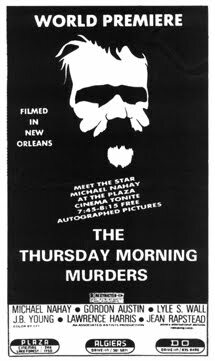 I have seen a few copies of this film in Europe on ebay from time to time but it is always on European format tapes.If anyone can find me a copy please contact me at cherrypittz@yahoo.com.I want to contact Woody Harrellson about a screenplay on the subject I would like to collaborate with Woody and my mom.If anyone knows how to contact Woody please get him this info or contact me at the above address.